b) secure the immediate and unconditional freedom of Sakineh Ashtiani, Sajjad Ghaderzadeh, and Houtan Kian. It has come to my attention that the Islamic Republic intends to execute Sakineh Ashtiani within the next two days. If the Islamic Republic executes Sakineh Ashtiani, I urge the French government to close the doors to the Embassy of the Islamic Republic of Iran in France. The honorable people of France, and in particular the women of France, have shown their broad and consistent support for Sakineh Ashtiani and her family; Carla Bruni Sarkozy has publicly advocated in Sakineh’s defense, and drawn a slanderous response from the Islamic regime for doing so; and France’s President Sarkozy has taken it as his personal duty to defend Sakineh Ashtiani. France should take the international lead in closing the regime’s embassy in Paris. It is the only appropriate diplomatic response to the Islamic Republic regime’s ongoing perpetration of human rights atrocities. b) to demand immediate expulsion from the UN Commission on the Status of Women of the Islamic Republic of Iran and all other states whose authority is dependent on gender apartheid and violence against women. 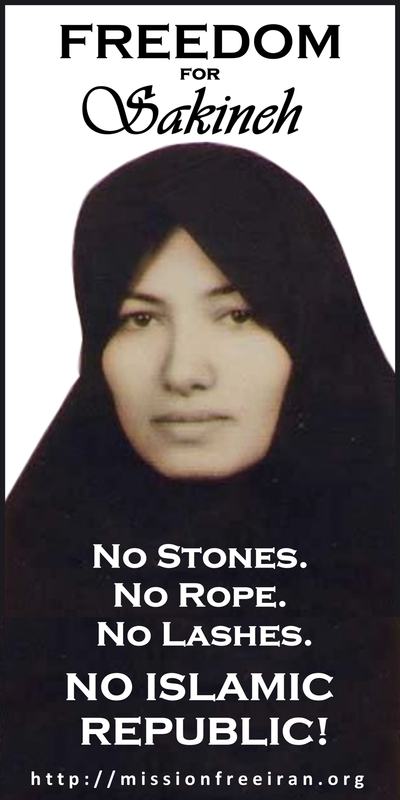 If Sakineh is executed, the UN will be held responsible for its refusal to act or even issue a strong statement against the stoning of Sakineh Ashtiani. 5) If the Islamic Republic executes Sakineh Ashtiani, regardless of how they implement the murder, people living near offices and embassies of the Islamic Republic should immediately deposit a pile of stones (painted red if possible) in front of the door or gate to the regime’s office or embassy. If feasible, tape photos and/or posters of Sakineh to the doors, windows, gates, etc. According to the news received by the International Committees against Execution and Stoning this evening, November 1st, the Islamic regime’s officials in Tehran have sent the order to implement Sakineh Mohammadi Ashtiani’s execution sentence to the office of sentence implementation at Tabriz prison. It has been said that they mean to execute Sakineh on Wednesday, November 3rd. We have previously reported that the regime has stolen the murder files of Sakineh Mohammadi’s husband from the office of Houtan Kian and from the court of the city of Oskoo in order to make the necessary fabrications that would show Sakineh as being guilty. Sajjad and Houtan had warned about this eventuality many times. With the arrest of Sakineh’s lawyer and her son, and holding Sakineh herself incommunicado, on the one hand, and by tampering with the case files on the other, the Islamic Republic’s “human rights” entity has declared in a press release that “according to existing documents, Mrs. Ashtiani’s guilt is proven.” Indeed, [despite their best efforts,] the Islamic Republic has created a whole scenario against Sakineh’s execution. We call on all concerned international organizations and people of the world to do all they can to prevent the killing of Sakineh. Sakineh, Sajjad, Houtan Kian and the two German journalists should be freed immediately and unconditionally. خبري که به کميته های بين المللي عليه سنگسار و اعدام رسيده است حاکي از اين است که جمهوری اسلامی در صدد قتل سکینه است. از تهران مقامات حکومتی دستور اجرای حکم اعدام سکينه محمدی آشتیانی را به بخش اجرای احاکم زندان تبريز فرستاده اند و گفته میشود که دو روز دیگر قرار است او را اعدام کنند. قبلا به اطلاع رسانده ایم که پرونده قتل همسر سکينه محمدی، از دفتر کار هوتن کيان و دادسرای شهر اسکو توسط رژیم سرقت شد تا دستکاری های لازم برای گناهکار نشان دادن سکینه انجام گیرد. سجاد و هوتن در این مورد بارها هشدار داده بودند و اکنون از یکطرف با دستگیری وکیل و پسر سکینه و ممنوع الملاقات کردن او و از طرف دیگر با با جعل پرونده، ارگان “حقوق بشر حکومت اسلامي” طي بيانيه ای اعلام کرده است که “طبق اسناد موجود٬ مجرم بودن خانم آشتيانی مسجل است”! در واقع جمهوری اسلامی کل سناریو را علیه سکینه درست کرده است. و این همه مساله نیست. سجاد و هوتن را در طول سه هفته گذشته بشدت شکنجه کرده اند که از آنها علیه سکینه و خودشان اعتراف بگیرند. طبق خبری که به ما رسیده است، بازجوئی توام با شکنجه هوتن در زندان تبریز تا دیروز توسط ماموران وزارت اطلاعات جریان داشته است. طبق این خبر مرحله مقدماتی بازجوييها يعنی مرحله شکنجه و اعتراف گيری از زندانيان به پايان رسيده و همه اين اسناد برای محسنی اژاه ای به تهران ارسال شده است. خانواده دستگيرشدگان بشدت نگران آنها هستند و اقدام آنها برای گرفتن وکيل و کمک به سجاد و هوتن، با پاسخ منفی مسئولين پرونده ها روبرو شده است. حکومت ميگويد اينها احتياجی به وکيل ندارند. قاضی پرونده گفته است که ما اختيار تصميم گيری نداريم. ما قضات نيابتی هستيم. تصميم در تهران گرفته ميشود و محسنی اژه ای مستقيما درمورد کل اين پرونده تصمیم گیری میکند. لازم به توضیح است که هوتن از موکلين خود و از جمله کودکان محکوم به اعدام و زنان محکوم به سنگسار دفاع کرده و اکنون به “جرم” اینکه گفته است سکينه قاتل نيست و نبايد سنگسار شود، خود زير شکنجه است. براي نجات جان سکينه و همه افراد بازداشت شده اين پرونده بايد اقدامات فوری و گسترده ای در سطح جهان سازمان داده شود. ما از همه سازمانهاي مدافع حقوق بشر و همه مخالفين اعدام و سنگسار ميخواهيم متحدانه به ميدان بيايند تا جلو اعدام سکینه را بگیریم. و مانع پرونده سازی علیه هوتن و سجاد و دو خبرنگار آلمانی شویم. سکینه، سجاد، هوتن و دو خبرنگار آلمانی باید فورا و بی قید و شرط آزاد شوند. Please put up my new post to make emailing the ministries easier. This is a matter of urgency. I have done 1-3 already and am trying to encourage others to do so immediately. Thank you so much! You do not have to post this comment. Thanks for doing that! I’ll add it now. This is wrong in a name of any God`s and religions. This isn’t about God or religion. It’s about extreme terrorists dictators & cowards hiding behind religion. No just deity would ever sanction such inhuman cruelty. This isn’t religion — it’s madness. Since I do not live near any Iranian embassy, I have suggested on my Facebook billboard that my friends send a protest e-mail to the Embassy of the Islamic Republic of their country, should the execution/murder take place. The e-mail for The Iranian embassy in France is cabinet@mfa.gov.ir . Even if it serves only to snow them in. Pour ceux qui n’ont pas de consulat iranien sous la main, j’ai suggéré à mes amis Facebook (au cas où l’exécution aurait lieu) d’envoyer un courriel de protestation à l’ambasade d’Iran : cabinet@mfa.gov.ir . Même si ça ne sert qu’à les inonder. This type of thing happens constantly over there – women are stoned to death if they’re raped – they get the blame for things they never do all the time. How did anyone find out about this particular case? Sakineh’s son, Sajjad, sent his letter to activists outside of Iran, and asked for help. We publicized Sakineh’s case, and opened a campaign for her, as we have done many times before. But there was something about this case – the heartbreaking letter from the children, the look on Sakineh’s beautiful face in that passport photo, the outrageousness of the “crime” she was to be executed for (adultery), and the terroristic brutality of the stoning punishment. All of these things together raised peoples’ ire, especially since we all remember watching women on the front lines of the June 2009 post-election uprisings. After June 2009, the world knew what Iranian women were fighting against, the world knows what they are fighting for – freedom – and the world finds honor in standing by their side and demanding justice. At a moment when the U.S.A. is under scrutiny and moral approbation for prosecuting a child soldier using circumstantial evidence and a confession obtained under physical and mental coercion, and my own country’s government refuses to step in to assist or defend him, or seemingly any other of its troubled citizens around the world, it is possible for Iran to show some initiative in the high profile case of Ms. Sakineh Ashtiani, by holding its justice to a higher standard. Refuse to believe confessions made under coercion, duress or torture. Do not let it be seen that citizens’ lives and the truth are expendable in order to save face when a case cannot be decided by clear undisputed evidence. Accept that it may be necessary that occasionally some guilty persons go free if at other times an innocent person will not be unjustly punished. Given that the evidence of Ms. Ashtiani’s guilt is unsubstantiated and contested, I and the world can only see injustice in her present conviction and sentencing to death. I personally believe that civil justice should not be influenced by religious or ideological concerns, but given that Iran does profess to follow Islamic law, why can you not show the world that this law can be the equal, or even superior, to western secular law? You say that God is merciful and compassionate, and that Mohammad prescribed kindness to widowed women and their children. You say that your customs protect women from harm. Well, let us see some of that superior moral force, by releasing Ms. Ashtiani and her family members. If you execute her it will only prove to the world that Iran is a barbarous nation unfit to exist in the modern community of nations. If you free her it may give everyone hope that Iran is not ruled only by clerical dogma, oppression, and force. Please free Sakineh Ashtiani. Send former President Bill Clinton and Secretry of State Hillary Clinton over there to get her and bring her to the United States of America!!! Thank you, this is the site I’ve been looking for! I’m trying to spread the word as well.